While Mesdag was standing on the highest dune in Scheveningen making sketches for his Panorama in 1880, surveyors were travelling the length and breadth of the country creating a new map of the Netherlands. What are the similarities and differences in methods between the artist and the scientist? 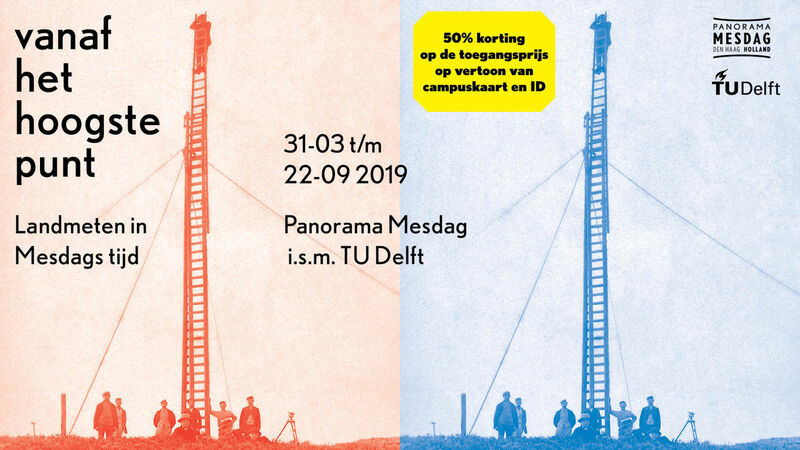 Panorama Mesdag and TU Delft have got together to create an exciting and accessible exhibition on this theme that can be seen in Panorama Mesdag from 31 March to 22 September. The TU Delft Library is offering the public a unique opportunity to come and admire its Special Collections outside the walls of the campus. In the exhibition rooms of Panorama Mesdag, measuring instruments, drawings and historical maps are used to show the history of land surveying in the Netherlands. Scientific photographs show the highest points in the landscape, including some spectacular structures that were built especially to facilitate the land survey. Visitors can also browse their way through digital and interactive maps showing earlier triangulation points established by Cornelis Krayenhoff and the Rijkscommissie [State Commission for land surveying]. These maps also show how the landscape has been constantly changing from the time of Mesdag until the present day. Especially for this exhibition students from TU Delft students of TU Delft, supervised by Professor Ramon Hanssen (Geoscience & Remote Sensing), carried out a surveying experiment on the Panorama to determine precisely where Mesdag was standing on the Seinpostduin when creating his Panorama. Their starting points were the lighthouse, the water tower and the church which Mesdag painted on his large canvas. These three buildings are still prominent in the landscape of Scheveningen today and serve as triangulation points. Now, 137 years later, modern technology can be used to compare these three points on the Panorama with their actual GPS coordinates. Just how accurate was Mesdag and how much artistic license did he use? The extraordinary results of this ‘land survey in the past’ are presented and explained in the exhibition. 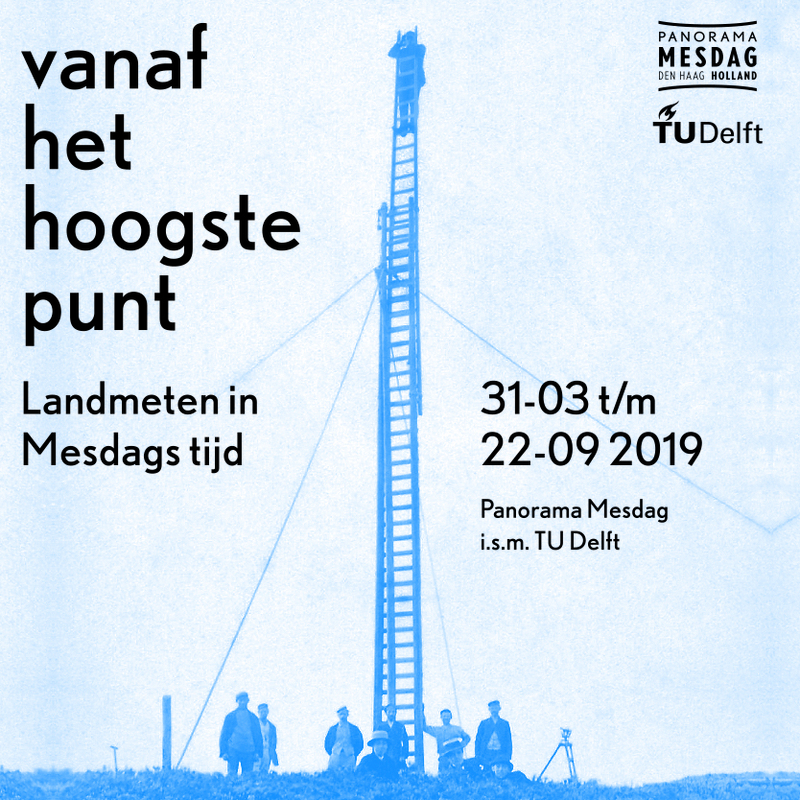 The exhibition ‘Vanaf het hoogste punt: Landmeten in Mesdags tijd’ can be seen in Panorama Mesdag from 31 March to 22 September 2019. TU staff and TU students receive a 50% discount on the admission price on presentation of their campus card and ID.